US President Donald J. Trump’s threat to devastate Turkey’s economy if Turkish troops attack Syrian Kurds allied with the United States in the wake of the announced withdrawal of American forces potentially serves his broader goal of letting regional forces fight for common goals like countering Iranian influence in Syria. Mr. Trump’s threat coupled with a call on Turkey to create a 26-kilometre buffer zone to protect Turkey from a perceived Kurdish threat was designed to pre-empt a Turkish strike against the People’s Protection Units (YPG) that Ankara asserts is part of the outlawed Kurdish Workers Party (PKK), a Turkish group that has waged a low-intensity war in predominantly Kurdish south-eastern Turkey for more than three decades. Like Turkey, the United States and Europe have designated the PKK as a terrorist organization. Turkey has been marshalling forces for an attack on the YPG since Mr. Trump’s announced withdrawal of US forces. It would be the third offensive against Syrian Kurds in recent years. In a sign of strained relations with Saudi Arabia, Turkish media with close ties to the government have been reporting long before the October 2 killing of journalist Jamal Khashoggi in the Saudi consulate in Istanbul that Saudi Arabia is funding the YPG. There is no independent confirmation of the Turkish allegations. Yeni Safak reported in 2017, days after the Gulf crisis erupted pitting a Saudi-UAE-Egyptian alliance against Qatar, which is supported by Turkey, that US, Saudi, Emirati and Egyptian officials had met with the PKK as well as the Democratic Union Party (PYD), which Turkey says is the Syrian political wing of the PKK, to discuss the future of Syrian oil once the Islamic State had been defeated. Turkey’s semi-official Anadolu Agency reported last May that Saudi and YPG officials had met to discuss cooperation. Saudi Arabia promised to pay Kurdish fighters that joined an Arab-backed force US$ 200 a month, Anadolu said. 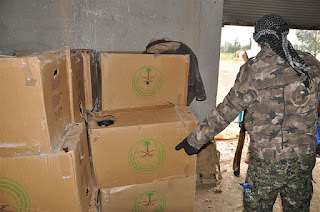 Saudi Arabia allegedly sent aid to the YPG on trucks that travelled through Iraq to enter Syria. In August last year, Saudi Arabia announced that it had transferred US$ 100 million to the United States that was earmarked for agriculture, education, roadworks, rubble removal and water service in areas of north-eastern Syria that are controlled by the US-backed Syrian Democratic Forces of which the YPG is a significant part. Saudi Arabia said the payment, announced on the day that US Secretary of State Mike Pompeo arrived in the kingdom, was intended to fund stabilization of areas liberated from control by the Islamic State. Turkish media, however, insisted that the funds would flow to the YPG. “The delivery of $100 million is considered as the latest move by Saudi Arabia in support of the partnership between the U.S. and YPG. Using the fight against Daesh as a pretext, the U.S. has been cooperating with the YPG in Syria and providing arms support to the group. After Daesh was cleared from the region with the help of the U.S., the YPG tightened its grip on Syrian soil taking advantage of the power vacuum in the war-torn country,” Daily Sabah said referring to the Islamic State by one of its Arabic acronyms. This week’s Trump threat and his earlier vow to stand by the Kurds despite the troop withdrawal gives Saudi Arabia and other Arab states such as the United Arab Emirates and Egypt political cover to support the Kurds as a force against Iran’s presence in Syria. It also allows the kingdom and the UAE to attempt to thwart Turkish attempts to increase its regional influence. Saudi Arabia, the UAE and Egypt have insisted that Turkey must withdraw its troops from Qatar as one of the conditions for the lifting of the 18-month old diplomatic and economic boycott of the Gulf state. The UAE, determined to squash any expression of political Islam, has long led the autocratic Arab charge against Turkey because of its opposition to the 2013 military coup in Egypt that toppled Mohammed Morsi, a Muslim Brother and the country’s first and only democratically elected president; Turkey’s close relations with Iran and Turkish support for Qatar and Islamist forces in Libya. Saudi Arabia the UAE and Egypt support General Khalifa Haftar, who commands anti-Islamist forces in eastern Libya while Turkey alongside Qatar and Sudan supports the Islamists. Libyan and Saudi media reported that authorities had repeatedly intercepted Turkish arms shipments destined for Islamists, including one this month and another last month. Turkey has denied the allegations. “Simply put, as Qatar has become the go-to financier of the Muslim Brotherhood and its more radical offshoot groups around the globe, Turkey has become their armorer,” said Turkey scholar Michael Rubin. Ironically, the fact that various Arab states, including the UAE and Bahrain, recently reopened their embassies in Damascus with tacit Saudi approval after having supported forces aligned against Syrian President Bashar al-Assad for much of the civil war, like Mr. Trump’s threat to devastate the Turkish economy, makes Gulf support for the Kurds more feasible. Seemingly left in the cold by the US president’s announced withdrawal of American forces, the YPG has sought to forge relations with the Assad regime. In response, Syria has massed troops near the town of Manbij, expected to be the flashpoint of a Turkish offensive. The same could be said from a Saudi and UAE perspective for Manbij not only with regard to Turkey but also Iran’s presence in Syria. Frontlines and tactics may be shifting, US and Gulf geopolitical goals have not.